They appeared seemingly overnight: hundreds of two-wheeled electric scooters all over the city of Santa Monica, California. The company behind the scooters, Bird, launched in the affluent beachside city last September with little advance notice, but its product was suddenly everywhere, littering sidewalks and clogging bike paths. Public officials were flummoxed that a company could do such a thing. But Bird did, and in the process has become one of the most out-of-nowhere success stories in startup history. Founded in 2017, the company has already raised more than $400 million, according to the startup database Crunchbase. It has reportedly sought valuations approaching $2 billion in its most recent talks. And it’s not alone. 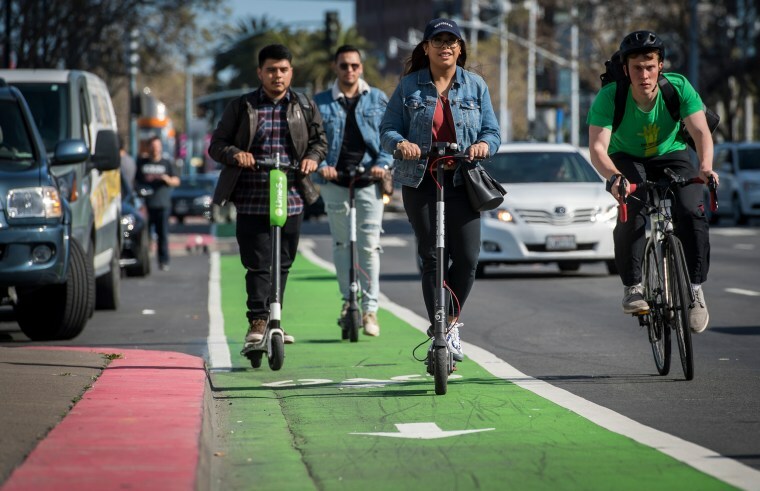 Lime, whose white-and-green e-scooters first appeared in the Los Angeles area about a month ago, is a direct competitor. There’s also Spin in San Francisco, which has also been dealing with a sudden invasion of scooter companies — and banned them from operating. The scooters work in much the same way as public bike-sharing companies. Most scooters, including Bird’s, are “dockless,” in that customers can grab one, use it for a quick ride, and then park it just about anywhere, all by using a smartphone app. At a public meeting in Santa Monica in June, residents described chaotic scenes of scooters being ridden by teenagers, sometimes two at a time, smashing into pedestrians and being left strewn about. And like bicycle riders, few scooter-users wear helmets, as California law mandates, and few obey state law that forbids riding on the sidewalk. It’s only been a few years since cities were dealing with the last startups that arrived without warning: ride-hailing companies such as Uber and Lyft. Cities then tried to manage their expansion, though most eventually relented or figured out deals to let them operate. Scooter startups are using similar blitzkrieg tactics, and cities are taking action. In December, Santa Monica filed criminal charges against Bird for operating without a business license and for violating other regulations. In February, the company agreed to a list of demands, including paying $300,000 in fines. But public outrage over the scooters was just heating up, as more and more Bird scooters appeared on the road in Los Angeles and 17 other U.S. cities. Bradley Tusk, founder of Tusk Strategies, a venture capital fund that invests in startups and works with them on regulatory issues, said scooter startups have had an easier time than Uber and Lyft because they’re filling a new niche. Being new means little competition, but it also means that cities don’t quite know what to do with scooter companies. “But it’s similar in that you have an entirely new transportation option that regulators aren’t sure how to handle, so there’s intense debate and interaction in every city,” Tusk said. The anti-scooter backlash is about more than just public safety. Like other tech companies, Bird and Lime seek to reimagine the public realm. Uber and Lyft turned cars into taxis; Airbnb turned spare bedrooms into hotels. With Bird and Lime, streets and even sidewalks are now thoroughfares for travel or for parking. Leaving scooters anywhere and everywhere is a feature for these companies, but a legitimate issue for residents. Dockless scooters are ridden standing up, and can be rented by anyone with a smartphone by downloading an app. Signing up takes just a few minutes (the user is asked to take a photo of his or her driver’s license and must sign a user agreement absolving Bird or Lime of any liabilities in the case of an accident) and then the user is free to zip quietly around the city. They cost a dollar to unlock and an additional 15 cents per minute. And they’re quick. The scooters can reach speeds of 15 to 17 miles per hour — well over the average speed of a cyclist. At night, people can make extra cash as “chargers,” plugging scooters into their home outlets for $5 to $20 per scooter then placing them back in specified areas the next morning. While there’s been plenty of initial skepticism about these companies, many people have been won over. Investors are similarly optimistic. Bird has had no problem raising cash, and neither has Lime, which on Monday announced a fresh $335 million in funding from a group of backers that includes Uber at a valuation of $1.1 billion. That makes it the second scooter company to become a “unicorn,” a slang term for startups that are worth more than a billion dollars. The appeal is simple: cheap, on-demand transportation that can make it easier to get around without a car. On Los Angeles, that’s an intriguing idea. Although the county is spending billions of dollars to construct an ambitiously sprawling network of subway and light rail lines, only a fraction of L.A. residents live within walking distance of a rail stop, and public transportation use in the city has been declining. City planners point to the stubborn “first mile/last mile problem” – that is, how to get people to and from their rail stops more quickly. Some think scooters may provide an answer, and Santa Monica may be the perfect testing ground, since it has both light rail and more than 100 miles of bike lanes.